NORTH PARAPARAUMU BEACH, NZ — When my friend Char first came to Paraparaumu several years ago, on a visit with her husband Chris and two young boys to visit Chris’s family, she took stunning photographs on North Paraparaumu Beach. At the time it was her inlaws’ backyard. She calls it her beach. The Sunday after we arrived in New Zealand, my body shut down and said “stop! You’re sick!”, so I spent most of the day in bed. Char suggested late in the afternoon that everyone pile into the car and go for a beach walk to “shake out the cobwebs”, so I piled into one of the cars (it took two to take all of them plus Rio the boxer dog, plus Mom and I!) with everyone else, thinking the fresh air would be welcoming. The beach touches the Tasman Sea, and you can see both Kapiti Island and, far in the distance, New Zealand’s South Island from this beach. After a real ripper of a storm, you can often find interesting seashells that are palm-sized. The weather had been fairly calm so we weren’t expecting any beach surprises, but we did find some interesting shells to take home. (A clam shell and tire tracks, above.) The beaches are considered roads here, and we saw a couple of trucks that drove past. Two-wheeled dirt bikes or motorcycles aren’t permitted on the beach, but that doesn’t stop people from riding them onto the packed sand. The fresh air was good for all of us. Beck and Angus brought us back shells that they found, and I revelled in the sight of Angus’ peaceful smiles. Beck, ever the playful one, did his special dance for me on one of the outflow type pipes that line the beaches. We learned from Char, who works for the Kapiti district council, that the shoreline is eroding. We saw one of the retaining walls that the district maintains, and you can tell that encroachment due to heavy storms is winning. Chris talked about the fishery in this area: I had recalled seeing pictures of him dragging for fish just offshore a few years ago, and asked about that. He said the fishery in the area was nearly wiped out (I can’t recall what fish) but fishermen decided to quit fishing to try and bring back the fishery. It worked, but it took a decade or so. All in all, the quick trip to Char’s beach really did shake out the cobwebs. PARAPARAUMU, NZ — After something like 26 hours of travelling (I lost count after having to sit an extra five hours at the airport in Auckland, NZ, when we missed our flight south to Wellington), we arrived in Paraparaumu yesterday, to visit my friend Charmead, her husband Chris and their two sons, Angus and Beck. I’ve missed almost two years of their lives now, after they moved to New Zealand from Port Alberni. I’ve known the boys since their births. Social media has kept us in touch and entering their home seemed like no time had passed at all. The boys grew up attending francophone school in Port Alberni–école des grand-cédres–a small school of less than 50 children who do their learning in French. The beautiful thing about a small school is how parents and other family members are able to be closely involved in their children’s learning. I attended several different events over the years at the boys’ school, including Angus’ last presentation before he moved, when he told his classmates all about the Vancouver Canucks, and that his grandfather used to play for the team before they joined the National Hockey League. Angus Skyped with his grandfather from Alberta, translating his classmates’ questions from French and his grandfather’s replies from English. I was so proud at his confidence. Today, my mom and I were invited to the boys’ school here in “Parapram”. Kāpiti Primary School holds an assembly every second Friday, where teachers give out awards: excel (role models), active learners, tu tangata (leadership) and Manaakitanga (respect). Teachers give out the awards, or they are chosen by fellow classmates. The principal also gives out an award, then there are some fun awards. There was also a presentation by two classmates on two of New Zealand’s birds, the wood pigeon (kereru) and the piwakawaka. The MCs for the assembly are students, and they introduce everything. Today’s MCs were two of Beck’s friends. The assembly lasts for about an hour. The Maori culture is very much intertwined in the education system here, especially in language. The assembly began with the students singing the national anthem in both Maori and English; it moved me to tears to hear this beautiful song. I asked Char if it was OK to take a quick photo of the slide with the words on it at the beginning of the anthem. They also have a school song, all in Maori, which they sang following the anthem. This school makes a point of building up their students in a safe, respectful environment. Angus and Beck are both enrolled in a Montessori program that just began a year ago as part of the school. It’s an interesting learning environment that works alongside the public school, and admittedly I don’t know that much about how it is integrated within the school. I do know the boys are thriving. Today was a privilege to be included in this small part of their education. I’ve always wanted to visit Canada’s northern climes. I blame late author Farley Mowat. When I was a child, I was a voracious reader—I still am. When in elementary school in Nepean, Ont., a suburb of Ottawa, I would read my way through a shelf of books, then move on to another. At some point, I picked up Mowat’s 1956 children’s novel, Lost in the Barrens (subsequent reprints titled it Two Against the North). It was an adventure tale of a white teenage boy, Jamie, and Awasin, another boy from a nearby Cree tribe; the setting was 1935 northern Manitoba and southwestern Northwest Territories. I was transfixed. There was a sequel, Curse of the Viking Grave, and I read that one too. I found the north fascinating. I have read other authors’ tales from those climes, from poet Robert Service to Pierre Berton and, closer to home, Lyn Hancock. I met Hancock when she visited a school in the Comox Valley, and again when her book Winging it in the North was released in 1996. She is an engaging speaker as well as writer, and I hung onto her tales. In the summer of 2014, I was one of two leaders to accompany a small—very small, only two members—Ranger group to the Yukon for an eight-day trip. We had chosen the location because none of us had ever been to the Yukon, and we could get a direct flight from Vancouver. At the time, I had visited every Canadian province except for Newfoundland and Labrador, but had never been to any of the territories. It was a great adventure: we drove to Dawson City from Whitehorse and worked our way back. We all agreed that eight days was too short. Lynn Hooper, me, Samantha Oldale, Casandra Dievert after hiking to Five Finger Rapids. Casandra Dievert, Lynn Hooper, me and Samantha Oldale at the MacBride Museum of Yukon History, in front of a Girl Guiding exhibit. In the winter of 2017, I had the opportunity to go back to Whitehorse, only this time I travelled with my mom. We both celebrated big number birthdays last year and thought a complete change of scenery, coupled with some adventure, would be a great way to recognize our milestones. Plus, it was the farthest north Mom had ever been. Yes, we were slightly crazy to go when the temperatures hovered around -31 degrees Celsius but “felt like” -38 and -40 degrees. We made sure to buy really good long underwear. We wanted to see the Northern Lights (aurora borealis), so scouted out a location north of the city during the day and went out one of our first nights in Whitehorse to wait and see if the lights would appear. They did not disappoint. They danced across the sky, with the lights of Whitehorse twinkling far below. We stayed outside for an hour watching, before our fingers became painful. It was time to get back into the car and get warm. We saw them twice more during our trip, including our final night in Yukon Territory. Magical. We went dog sledding with Alayuk Adventures’ owner Marcelle Fressineau, who has competed in the Yukon Quest and Iditarod long distance races on several occasions. We went snowshoeing with a guide from Boreale Ranch, where we were also able to view the Northern Lights on more than one occasion. We visited the Yukon Wildlife Preserve, and I tried to freeze my hair in the sub-zero temperatures while enjoying the warmth of Takhini Hot Springs (believe it or not, it was too warm to freeze my hair, although it did get frosty). One of the highlights of the trip, though, was a day trip to Haines Junction and the entrance to Kluane National Park and Reserve, along the Alaska Highway. Kluane is home to Canada’s highest peak, Mt. Logan, which towers above the others at 5,959 metres (19,551 feet). The temperatures were cold, the wind was biting but the vistas were incredible. It was a great achievement to see this national park as Canada celebrates its 150th year. I did this drive in 2014 with the Rangers, and wanted to view those mountains under a blanket of snow. I’m glad we took the trip in 2017, as the sun was shining, the company was amazing, and the drive was just enough to let me know my relationship with Canada’s north is not over. We have this cool place near the waterfront in Port Alberni that opened nearly two years ago, called the Alberni Aquarium and Stewardship Centre. It’s a neat place to hang out (much like this hermit crab). They have touch tanks for the brave, a ball pit for the young (not the young at heart–they frown upon adults in the ball pit) and they have changing programs. Last year they brought in a Build-a-Whale project by the Strawberry Marine Research group, which is just like it sounds: you literally build a whale skeleton on a wooden form. The whale is coming back to the Alberni Aquarium this month, from Feb. 20 to March 20, 2018. I was always fascinated with the whales at the Vancouver Aquarium when I was young: we moved from Ontario to BC in the late 1970s and I had never seen ocean creatures close up before the Aquarium. When I first started my journalism career I learned how to scuba dive off Quadra Island. I’ll never forget the first time I ducked underwater in the ocean and took a breath. I could hear my breathing through my regulator, but what was even more fascinating was seeing all the life below the waterline. I came face to face with a small dog shark, and fed wolf eels by hand. I dove off the coast of Australia in 1999 with my friend Kris, off Byron Bay–one of my favourite places on the eastern Australian coast. We saw sharks during one of our dives too. I doubt I will ever lose that wonder of the deep. I love that we have a well-managed piece of marine education like the aquarium right on our waterfront. For the first time since American sequestration grounded US airshow acts in 2013, an F-22 Raptor from Langley Air Force Base in Virginia will fly at the Abbotsford Airshow. “It will be the first time that we’ve left the country to perform an airshow since sequestration in 2013,” Raptor demonstration pilot Major John (Taboo) Cummings said. 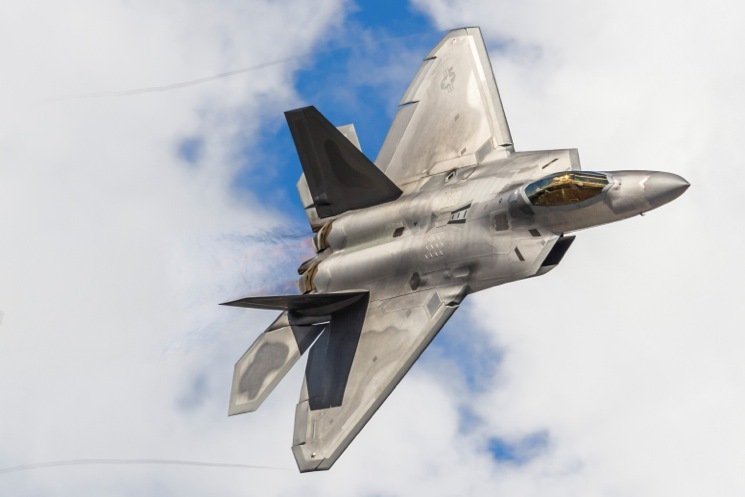 “We’re pretty excited about it.” The F-22 team was in Abbotsford earlier this year for a reconnaissance trip and they’re looking forward to returning partway through a three-week road trip. “That airshow is renowned for its hospitality and they took great care of us,” said Cummings. “We can’t wait to bring the aircraft up there. It might be the first (visit) in Canada for some of the mechanical team members. It should be really exciting.” Cummings is the United States Air Force F-22 Raptor Aerial Demonstration team’s commander and pilot based at Langley Air Force Base in Virginia. He has been flying the Raptor at airshows for two years. He will fly one more year before a new demo pilot takes over. 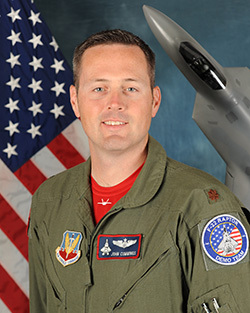 Major John “Taboo” Cummings, commander of the F-22 Raptor aerial demonstration team out of Langley Air Force Base in Virginia. Cummings said he flies in about 20 airshows per season (he’s already appeared in about a dozen) in addition to his regular USAF duties. Sequestration in 2013—which was like a large budget cut across the US government—has meant a more streamlined airshow schedule for American military teams, he added. Sequestration grounded the Blue Angels jet demo team in 2013, and Canadian airshows like Abbotsford lost all US aircraft for a couple of years. Cummings sees that changing, but acknowledges it will never be the same. “In the past the US had seven demonstration teams. In 2014 it was just the Raptor. This year we brought back the F-16. Twenty shows is about as much as we’ve done in the Raptor. I don’t think it will ever be what it was five or so years ago.” Cummings, for one, is excited to be back in the plane and flying in front of airshow crowds again. “This jet goes like nothing else,” says Cummings. “When we’re flying we take off and can be in altitude in minutes. We can be flying through 50,000 feet and it can be 30 degrees outside. It doesn’t take all its power. It’s a pretty incredible machine.” The Raptor has a service ceiling of 65,000 feet and can fly as fast as Mach 2.25, but Abbotsford Airshow spectators won’t see the jet break the sound barrier. “Our demo profile is a little unique,” says Cummings. “While we do some classic aerobatic maneuvres that others do, most of the maneuvres were designed to teach new pilots to fly the plane and demonstrate its capabilities.” The first move in the show is a power loop. Another is the tail slide, where the plane will fall backwards and be completely controllable. Cummings is looking forward to the heritage flight he will fly with a P-51 Mustang and F-86 Sabre. “We’re all flying together, which is pretty cool,” he said. It’s also a challenge to keep up because of the varying flight specifications of the heritage aircraft vs. the F-22. “When it’s just another jet aircraft it’s pretty easy. When you add a P-51…it becomes a challenge. They’re flying near their top (performance) and we’re flying more towards our slow end.” The Raptor is expected to fly both Saturday, Aug. 8 and Sunday, Aug. 9. “It’s the first time (the Raptor) has been allowed to stage from the ground at an airshow in Canada,” Abbotsford Airshow media spokesperson Jadene Mah said. “Usually they just pop them over the border” from an American air force base. The Raptor will be behind security lines on the hot or active ramp at the airshow, but aviation enthusiasts will still be able to see the high-powered jet. “People will get to see it on the ramp but they won’t be able to see it on display,” Mah said. The Raptor is one of three jet demo teams expected at the Abbotsford Airshow this weekend: others are the Canadian Forces CF-18 and the US Navy’s FA-18 TAC team. There are also three jet aerial demo teams—Breitling, Horsemen and the Snowbirds—and the flight commemorating the 75th anniversary of the Battle of Britain. For ticket information, directions and both flying and static displays, please go online to http://www.abbotsfordairshow.com or follow @AbbyAirshow on Twitter. I can no longer call myself a beginner knitter. After nearly three years, I have accomplished a few things (like knitting scarves for my sister, niece and nephews, my first toque, my first sock, my first baby bootie) and had a few things that didn’t quite work out, like the first baby blanket (I finally took it apart and donated the yarn to Hugginz By Angel, a non-profit business run by Angel Magnussen, who sews blankets for sick children and also knits scarves and hats for them) and the scarf I made for my friend Lisa, who has been knitting for several years more than me (I messed it up so badly that I finally had to call her to help me fix it, and she took it away so she could finish it herself). In between, I developed tendinitis in my right thumb, and being right-handed it was a bit of a problem. I quit knitting for many months so that I could function at my job, when really I should have done it the other way around. But alas, yarn doesn’t pay for itself. My first toque, Sandoval Hat Pattern (http://www.ravelry.com/patterns/library/sandoval-hat), a challenge accepted a completed for Chris M., husband of my good friend Charmead. The baby blanket, unraveling it using my ball winder. Can’t claim originality on that one, but it sure worked well! Here’s the problem: I often choose projects that come in twos, but I only finish the first one of a pair before moving on to another project (I haven’t yet learned to make some of these twos two at a time). 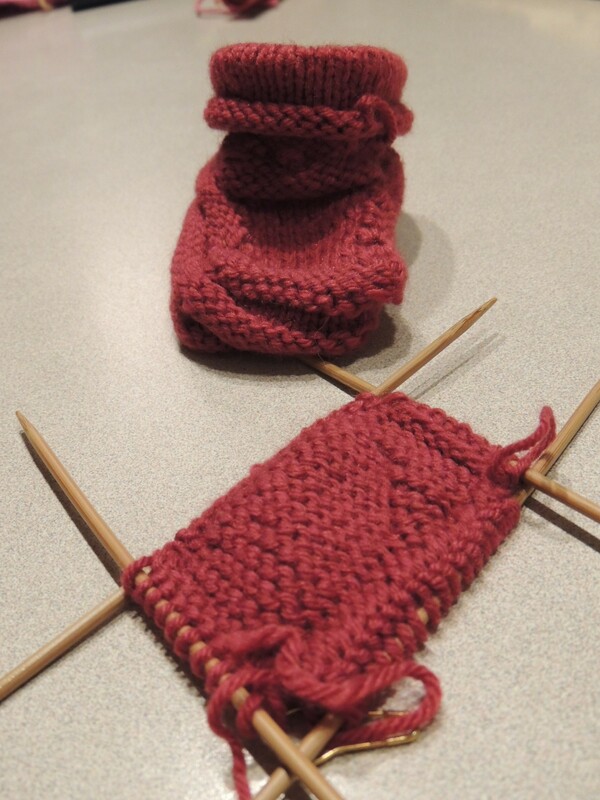 I switched to baby booties so I could try something small, and something on double-pointed needles (DPNs), thinking something smaller would cater to the instant gratification I often crave while knitting. My most infamous “two” that has yet to be finished is my sock. 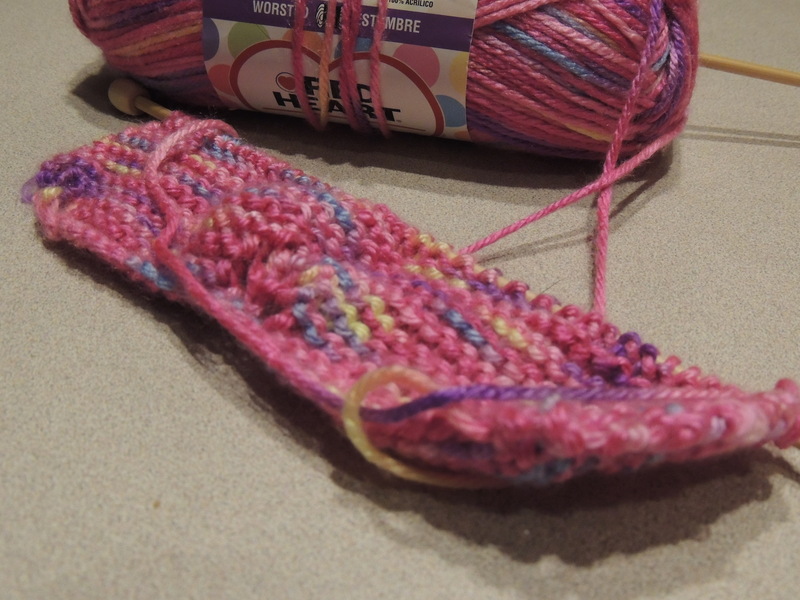 I took a sock knitting class three years ago February, which my friend and knitting mentor Beth Scott was conducting at a knitting store where she used to work. She was confident I could finish the sock even though I had only tackled dishcloths and a scarf at that point—all straight things. I had only been knitting for a year when Beth S., my friend and knitting mentor, suggested I join her sock knitting class. “You can totally do this!” she said. It took me five—FIVE—trips back to the Village Yarn Shoppe in Comox to finish my sock, which I ultimately made into an ankle sock because I wanted to finish it! That was nearly three years ago. I finally cast on the second sock, but still have not finished it. 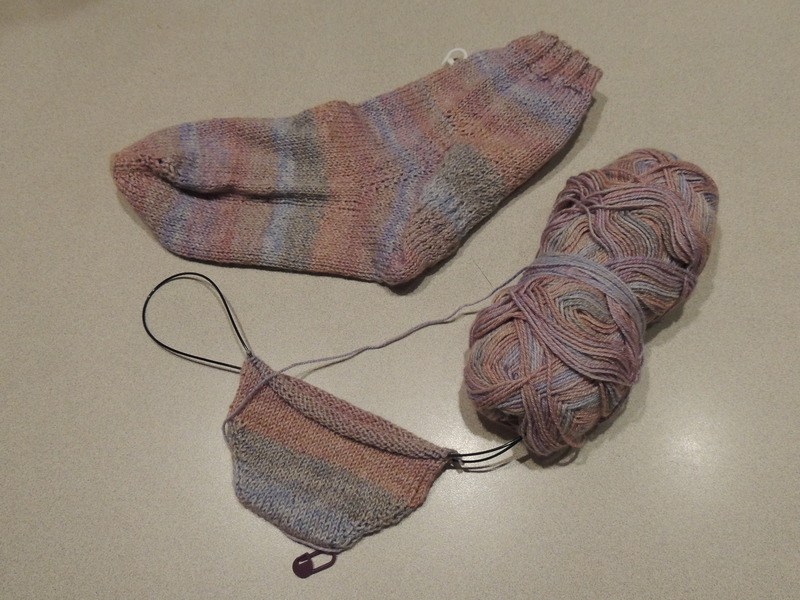 The second sock is still not finished. 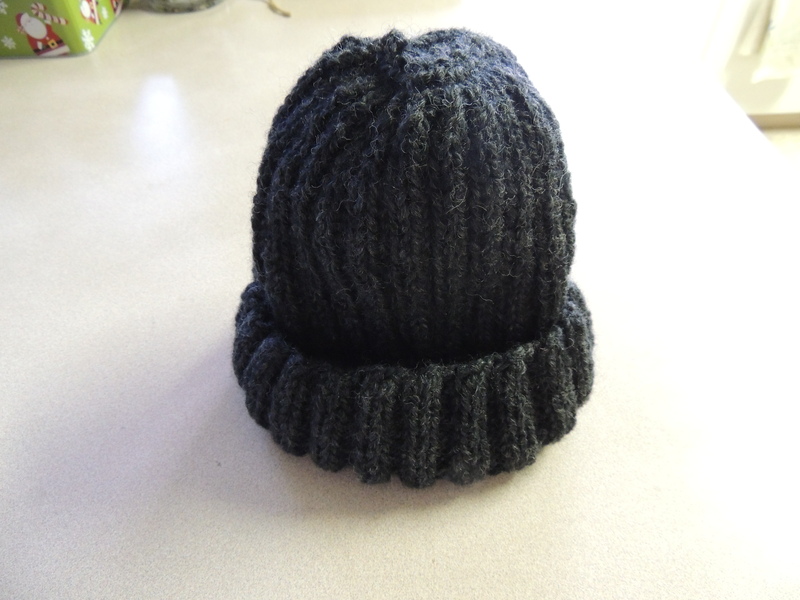 …and the second bootie—not the same pattern! Basic Baby Booties, by Bernat Design Team; a different way to make a baby bootie, on straight needles, thanks to my friend Teresa B. for the pattern and suggestion. Besides the sock, this is my favourite “two”, and the one I will probably finish first: a fingerless glove. My motivation to finish is that my mother also wants a pair, and I already have the yarn for it. 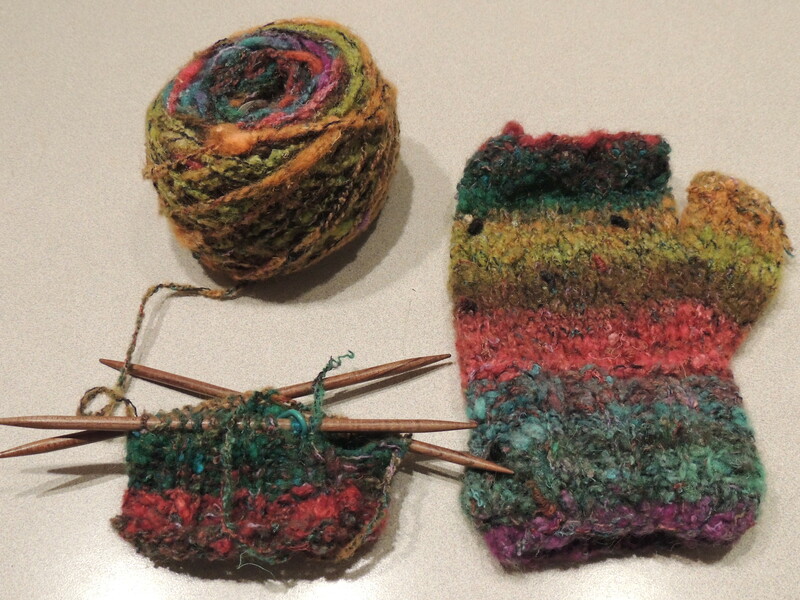 Happy fingerless glove in Noro Mossa yarn, courtesy Pages and Stitches in Amherst, NS. Assistance on the first glove by my sister. Second project on DPNs. 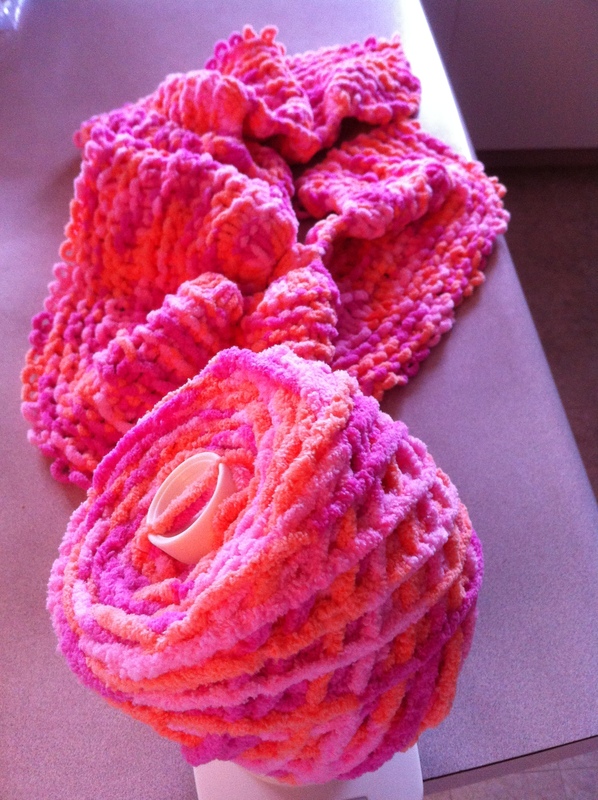 So my knitting goal for 2015 is to finish my twos. Just don’t get me started on my unfinished projects (UFOs). Ever since I learned how to write, I’ve wanted to tell stories. That’s what has kept me going for the past 28 years as a community news journalist. I love the fact that my job is not 9 to 5. I get to ask as many questions as I want, because it’s my job to do so. If I’m curious about something, my press credentials give me leave to find answers. I also get to meet some incredible people, and do some pretty awesome things. 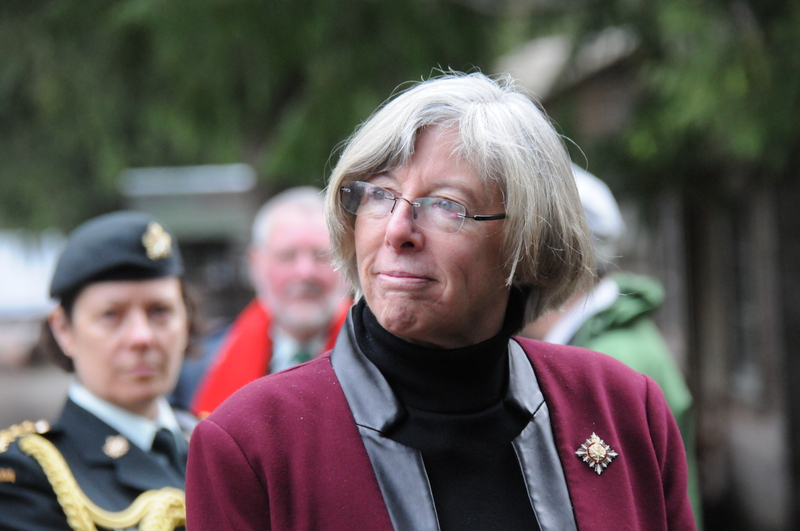 This week, I followed British Columbia’s 29th Lieutenant-Governor, Judith Guichon, around the Alberni Valley as she visited a gymnasium full of enthralled elementary school children, took a ride on Port Alberni’s famed steam train and received a walking tour of McLean Mill National Historic Site. She also visited the Tseshaht First Nation to open a new subdivision on the reserve, visited seniors at Echo Village and attended a reception at the Hupacasath First Nation House of Gathering. She had previously spent two days touring Ucluelet and Tofino on the West Coast of Vancouver Island. British Columbia Lt.-Gov. Judith Guichon tours McLean Mill National Historic Site on Feb. 3, 2015. Her Honour was sworn into her appointed position on Nov. 2, 2012. Prior to that she owned and operated Gerard Guichon Ranch Limited in the Nicola Valley. She is a down-to-earth person who loves her province and has resolved to visit “every valley” in B.C. before the end of her five-year term. 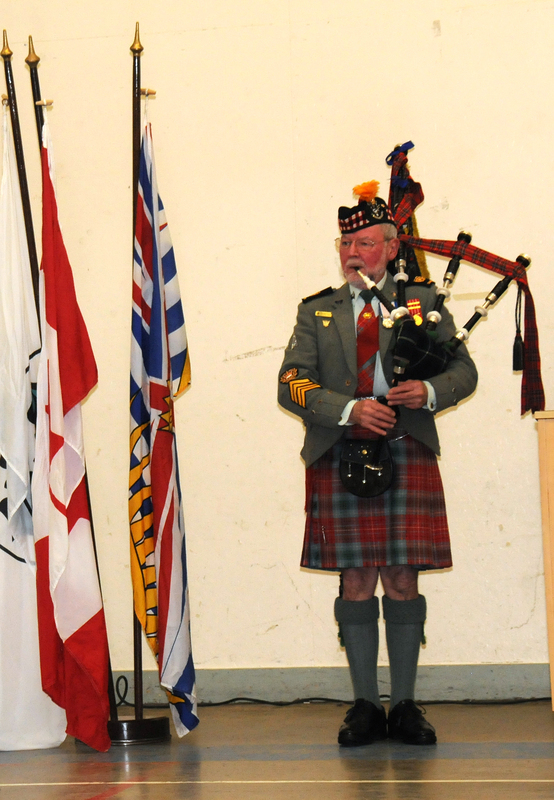 Guichon is the third Lieutenant-Governor I have met: David Lam was the first, when I was a Pathfinder; Iona Campagnolo the second, when I was working with the Comox Valley Record (she lived in the Comox Valley). It was an honour to spend some time following her on her tour; but meeting her was not my highlight this week. Meeting John B. Mager, her chauffeur, was. John Mager is a pipe major (“Now look at this, I’m a pipe major and I’m a Mager,” he said as he handed me his card) and wears his Scottish plaid (I think he said he was with the Seaforth Highlanders, but don’t quote me on that) at the events where he also pipes in the Lieutenant-Governor. 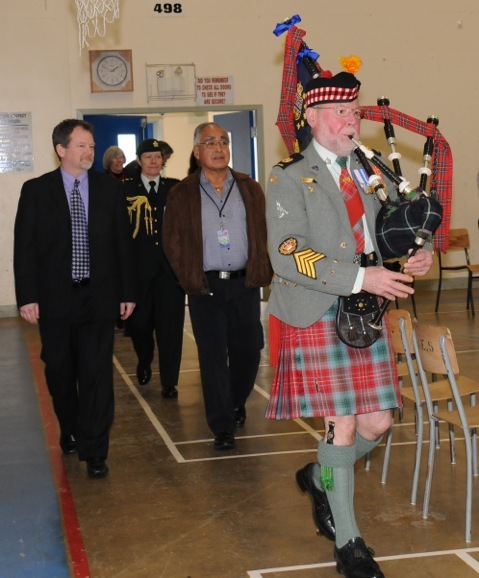 John B. Mager pipes in local dignitaries and Lt.-Gov. Judith Guichon during an appearance at Alberni Elementary School, Feb. 2, 2015. John B. Mager wrapping up his piece of music in the Alberni Elementary School gym, Feb. 2, 2015. He is also the website photographer (he’s a fellow Nikon user) for Government House when the bagpipes and car keys are put away. Mager loves his job, which is a very good thing: he’s been doing it for 33 years. “This is my seventh Lieutenant-Governor,” he said. When he began his job, Henry Pybus Bell-Irving was the lieutenant governor. Then followed Robert Gordon Rogers, David Lam (first Asian Lt.-Gov. ), Garde Gardom, Iona Campagnolo (first female Lt.-Gov. ), Stephen Point (first aboriginal Lt.-Gov.) and now Guichon (“I guess I’m the first rancher,” she told students at Alberni Elem.). Mager lives in the coachman’s cottage beside Government House, so he is close by. 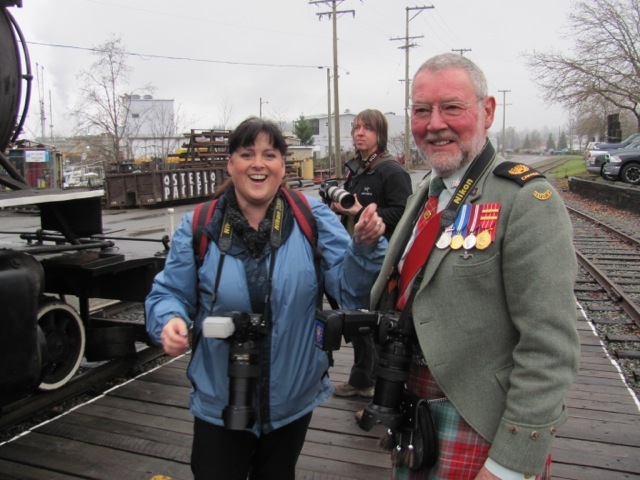 I wish I had had more time to talk to Mager; he has an ebullient personality, and I didn’t see him without a smile on his face, even when walking through the chilly mist in his kilt at McLean Mill. I’m looking forward to the next time I get a chance to visit with him. 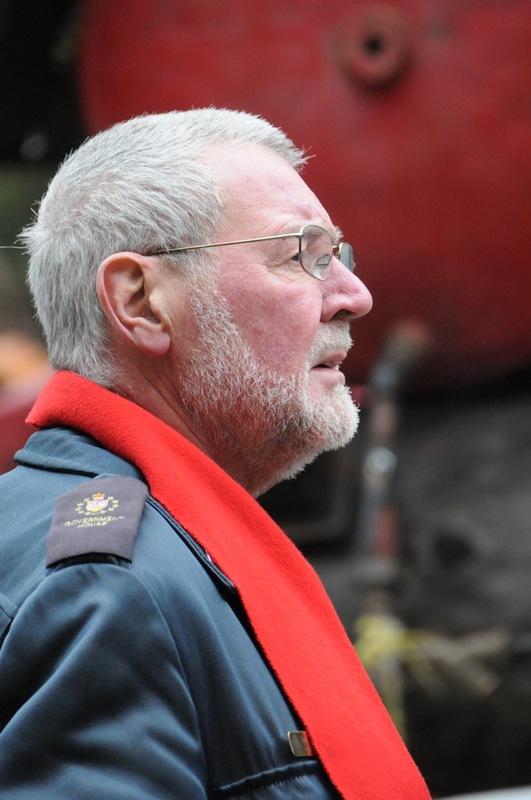 John B. Mager listening to Neil Malbon during a walking tour at McLean Mill National Historic Site, Feb. 2, 2015.